Oats Dosa is one of the easiest and instant dishes you can make. All you need is to mix the flours and make the dosas right away. In this version of Oats Dosa, I used ground Urad Dal flour. While one may not expect everybody to have Urad dal flour on hand, you can always replace that with just Rava as well. I skipped using Rava in this recipe and still the final dosa was very lacy and had a good texture. I also felt that Rava sometimes make the dosa little soft and soggy if not mixed in right proportion. I had nearly 4 dishes of this week to be done, and I had planned for the Sunday Dinner. A couple of dosas needed fermentation and I had the foresight to soak and ferment the previous day itself. Since I ended up having 3 batters I almost gave up making this, only to realise that O is ahead of other letters and I better prepare myself. I remember Konda saying that when she is asked for the alphabetical order, she sometimes goes from A, and I said I always go from the previous letter. Remembered my conversation when I almost scheduled P for today. So coming back to the dishes to try, since all of us eat only 2 dosas no matter what, I had a tough task as Daddy was out for dinner and it was only Amma, Hubby dear and Myself. It was something else for the kids and obviously, they won’t budge from their schedule menu. One version was tasted by Amma and me as Hubby dear refused to have anything with it on hearing the name. I will share it when I come to that letter. Maybe some of you can take a guess. He liked this dosa as he thought it was Rava Dosa and I wasn’t about to correct him. Anyway, he has asked me to repeat this and make it a regular one, which naturally makes a thumbs up for this. Oats Dosa is my choice for O, in the AtoZ Flatbreads and More, where I am doing AtoZ Dosa Varieties. 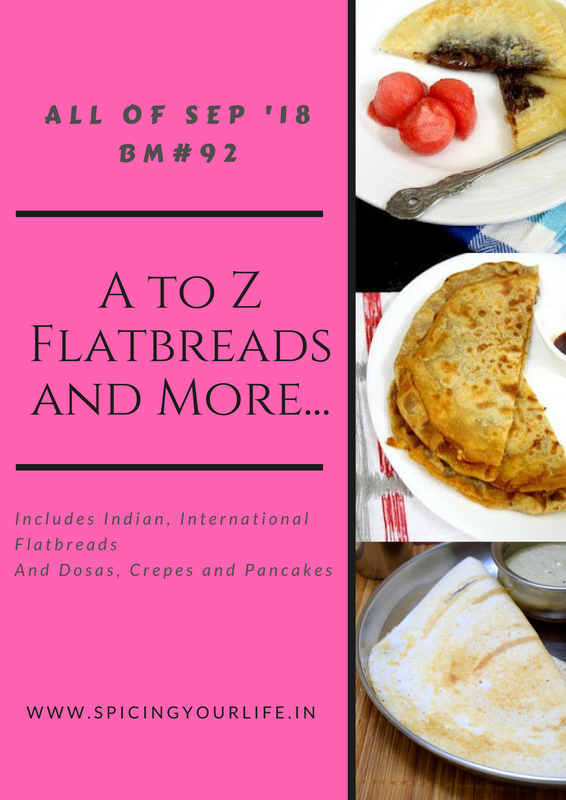 If you are interested to know whats for O in the Indian Flatbreads, pls check it out. Add cumin seeds, crushed peppercorn, and cashews if you wish, along with salt. Slowly add water to make a thin batter. When you pour, you should have free flowing batter. Heat a nonstick tawa and ensure it is greased. Pour a ladleful of batter in a circular motion and swirl the tawa to spread the batter. Sprinkle oil and ghee and cook on low flame till the dosa leaves the tawa. Turn and cook on the other side as well. Oats dosa is a life saver most of the time….and this version with urad dal flour sounds lovely! And I am glad to see you also do the same thing…so many times I have the later alphabet dishes ready but not the one I need tomorrow. Mega BM is absolute chaos at home! Never get bored of oats dosas.And that lacey dosa looks so tempting to enjoy without any fuss. Wish i get a plate of this fibre rich dosa with some spicy onion chutney, mouthwatering already. This why I don’t give them the name of any new dish. They won’t even touch. So it is better to let them name it. Now I really what to know what made your hubby say that. Lol! The dsas look so nice and crisp Valli. This easy breezy version looks so yum..
After coming across so many versions of dosas in this BM I’m tempted to try them all! Have not tasted or made oats dosa. Your lacy version is a sure temptation to try it out. I can so relate to this. Even I was like hold on q is far only to realize no it’s this week and I have to make it.haha. adding urad Dal batter is a very good idea I would say. Dosa looks yum. Great pick with O, and love the way of adding oats flour in diet. I make this quite often as a quick weeknight dinner. This is such a versatile recipe for breakfast or dinner. I have not tried adding urad dal flour. Will try that next time. oats dosa is really quick to make and so delicious. Love such recipes where no fermentation required. I make oats and semoilna dosa only bcoz they are instant and without fermenting. looks absolutely tasty. I was left without a choice but for Oats in this BM. I too have even Z ready but some for week one were not even finalized! I have never used urad dal flour in instant dosas.Will remember to add it from now on.